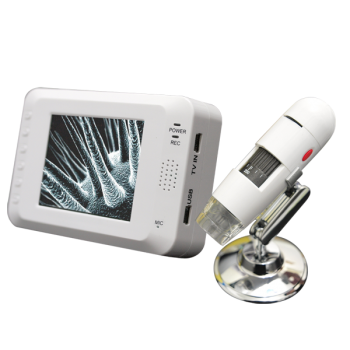 The Digitech-i Video Microscope is a portable magnification device which can easily be operated by plugging into the 2.7’ LCD unit directly enabling you to magnify objects up to 200x. Enhanced with adjustable light control, video/audio recording and external SD card slot for storage, it can capture high quality images (JPG) and videos (AVI). The full package includes a 2.7inch LCD screen, 50x~200x microscope, lens cover and a detachable stand. Additionally, this high-tech video microscope works on 4 x AA batteries which makes it a perfect candidate for outdoor and indoor projects for scientific teaching and research. It is a very handy portable device to fill your microscopic needs.